Youth Empowerment > Record participation of 2650 at annual Prague Sea Scout Regatta! (JUNAK/HKVS/Prague) – This year, more than 2650 participants – Scouts, Guides and general public – from all over the Czech Republic gathered on the banks of the Vltava River in the morning of 28 September and celebrated Wenceslas Day in a very spectacular way and under the watchful eye of many locals and tourists gathered on Charles Bridge and elsewhere along the course. 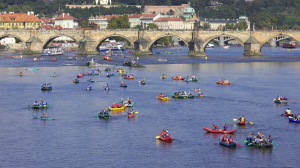 They took part in the annual Prague Sea Scout Regatta “Napříč Prahou – přes tři jezy” (Across Prague – Over Three Weirs) which is one of the major events of Czech Sea Scouting, or rather Water Scouting, as this branch of Scouting is called in that land-locked country in Central Europe. It looks back on almost 80 years of history and tradition and is one of the highlights in the calendar of events in Prague. 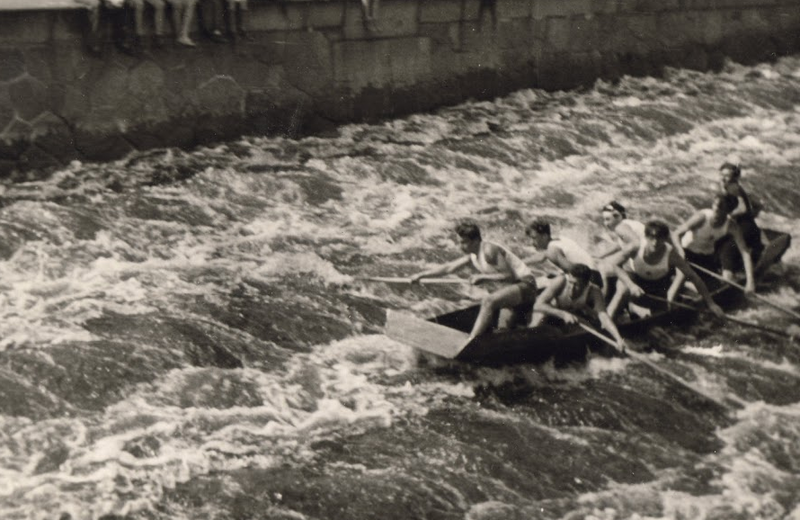 It was back in the early months of the Second World War, when the members of the 13th Prague Water Scout Group organised the first regatta in spring 1939 to mark the opening of their new Scout Den. With ups and downs the tradition of the regatta continued to this day. 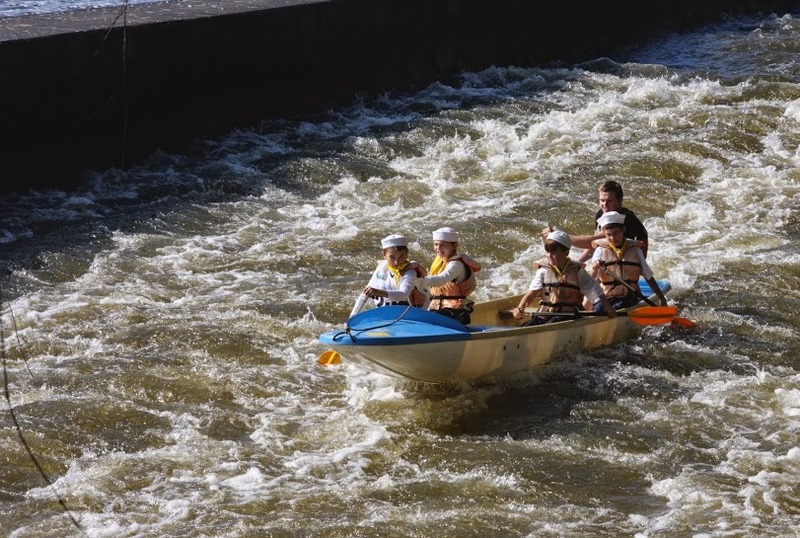 The 2014 edition was the biggest ever – thanks also to the fact that the event is now open not only to Scouts and Guides but also to the general public (which can also borrow boats if they do not have their own). Prizes are awarded in different categories for Scouts and Guides according to age and the type of vessel. The main boat for the race is the “pramice P530” (seating five Scouts or Guides), but there are also canoes, kayaks, rafts and paddle boards. 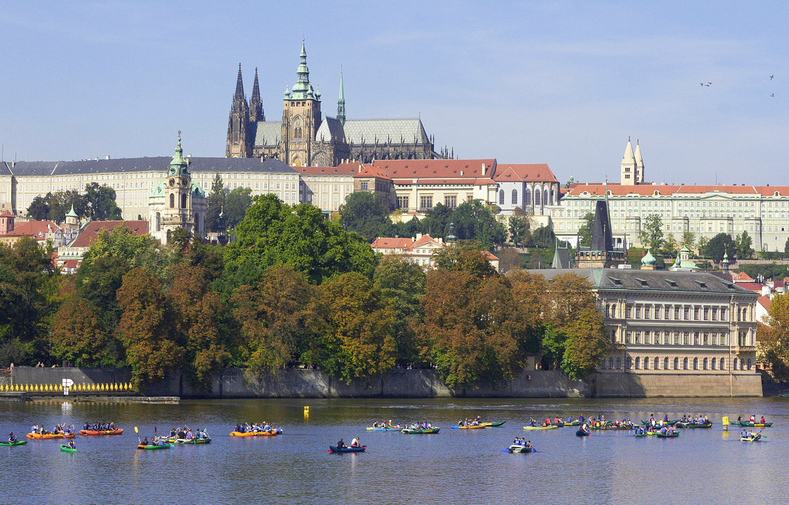 The regatta course is 6,5 km long and foillows the Vltava River through the historical centre of Prague. The start is at Císařská louka (The Emperors Meadow) and the finish line at Štvanice Island. On their way, the participating crews have to master three obstacles: Štítkovský weir near Jirásek Bridge, Staroměstký weir at the Charles Bridge and finally Helmovský weir in Holešovice. Hence the name of the race! A Cub Scout crew mastering Helmovský weir in the 2014 regatta – and the photographer stood at the same spot as his colleague in 1948! Each of the three weirs has its proper challenges requiring technical skills and good seamanship but the most spectacular one is perhaps the one at Charles Bridge, as confirms Alžběta (10 years), who took part in the race with her Guide patrol: “The most difficult passage was the second weir! But it is hard to paddle at the same rhythm all along the course. If you lose the rhythm you are quickly in difficulties.” Many of the spectators watching have witnessed the capsizing of even some experienced watermen at this spot. But it is all worth it agree participants, as the passage across the three weirs is only open once a year for this particular race. Congratulations to all competitors and particularly to this year’s winning crews from the 5th troop of the Water Scout Group in Vysoké Mýto (Rover Scout Category), the 7th troop of the Water Scout Group in Pardubice (Scout Category), the 7th troop of the Water Scout Group in Hradec Králové (Guide category) and the 5th troop of the Water Scout Group in Vysoké Mýto (Cub Scout category). And you? Are you interested in participating in this fantastic event next year? No problem! 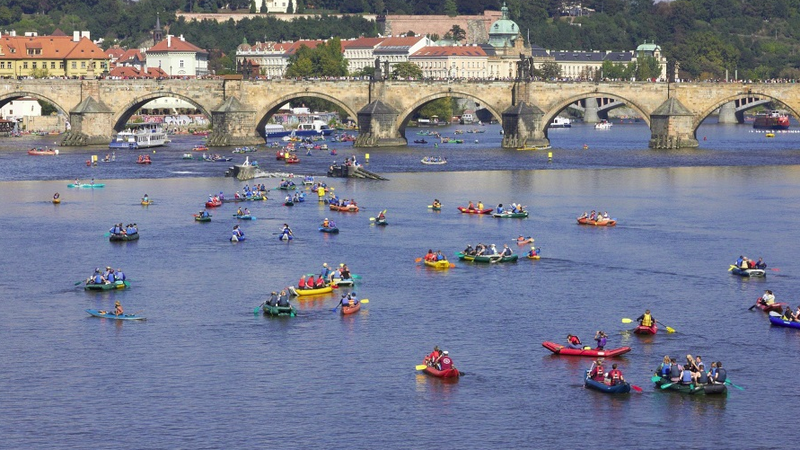 The race is open to Scouts and Sea Scouts from abroad and boats can be borrowed in Prague. So, pencil down the date – 28 September 2015 – and make sure to register for the 2015 edition of the Prague Sea Scout Regatta “Napříč Prahou – přes tři jezy”! – about Czech Scouting and Guiding on the internet and on Facebook.